Zestos: Enabling life through communication of research: Is your olive oil from irrigated or non irrigated trees? Is your olive oil from irrigated or non irrigated trees? Produce growers are paid on quality and quantity. Quality is typically defined as visual and/or sensory appeal. Modern growing methods have been focused on increasing production of "high" quality produce. As the nutritional content of the food is not seen as being important, often the increase in the yields results in a decrease of nutrients in the produce. Here is yet another example of this - in olive oil. 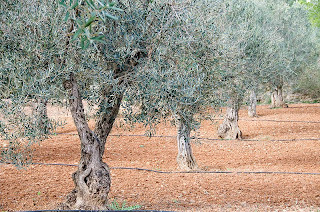 Unirrigated olive trees produced on average 987 and 980 olives per tree over two seasons. Irrigated olive trees produced 1489 and 2215 respectively. That is approximately a 50% and 100% increase in yield. However this increase in yield diluted the oils polyphenols. Polyphenols are the "good stuff" in olive oil, the antioxidants and the other molecules are good for you. The concentration in the unirrigated trees oil was 253 and 227 parts per million (ppm) over the two seasons. The irrigated trees olive oil was only 166 and 150 ppm. That is the concentration of the healthy compounds in olive oil were only two thirds of the non irrigated olives. Did this decrease result in decrease of "quality" that is the sensory aspects of the oil? No, using the sensory tests as specified by the International Olive Oil Council there was no decrease in quality between the oil from unirrigated and irrigated olives. Infact the irrigated olives had decreased bitterness so are seen as better. So if you were are farmer would your irrigate? It increases your yield between 50-100% (depending on natural rain levels) and does not decrease the dollar value of your oil. Irrigation seems the logical choice. Have a closer look at the above picture, clicking on it will make it larger. What are those black lines on the ground?